The school timings from Friday, i.e. 5th April, 2019 will be from 7:20 am to 1:20 pm. New session for class XI will commence from 8th April, 2019. The aim of the institution is to make its pupils cultured and useful members of society. When they enter the world they should be able to take an active interest in the betterment of their homes and community and when they grow up, they should be able to fit themselves usefully into the world of tomorrow. Candidates to come for interview along with relevant documents (Pre board marksheet and Certificates of achievements). Selected candidates will be informed by email or call. If fees is not paid by the given date for the selected candidates, admission will stand cancelled. The learnometer test 2 reports for the students of grade 1 to 5 can be downloaded from the link below. Kindly follow the steps as mentioned. In the example, 3123 is for grade 3, learnometer id 123. Time Table for Final (Promotion) Examination and C.B.S.E. Board Examination has been uploaded on DOWNLOADS>Examination Time Table module. If fees is not paid by the given date for the selected candidates, admission will be given to the waitlisted candidates. Click the link given below to access the list of selected candidates. *Candidates to report at the school Reception by 09.45 am on 23rd February 2019. This is hereby informed to the students of class 10th that preparation leave will be start from 12/02/2019. The book is being designed and conceptualised by the Students of Class XII. Chinmayee Babbal is the student representative. The cost of the year book will be borne by the students who have agreed to the proposal and the amount will be deducted from the Caution money held with the school. Preference will be given to the firm providing lowest rates for the given configuration as well as Operating System. Further, quoted rates should be inclusive of all taxes. TIME TABLE OF PERIODIC TEST-2 (VI - VIII) / PERIODIC TEST-3 (IX & X) / ASSESSMENT - 3 (XI) / PREBOARD (XII) - 2018 has been uploaded. Kindly check the DOWNLOAD>EXAMINATION TIME TABLE module for Periodic Test - 2 (VI - VIII) / Periodic Test - 3 (IX - X) / Assessment - 3(XI) / Preboard (XII) / Practical Exams (XI & XII) - 2018 -19 time table. The School is organizing a Health checkup camp for students from class I to XII. It is mandatory for students of classes IX to XII to be present for the Health ckeckup as the details of their health will be recorded in the Health and Activity Record as per the CBSE guidlines. The winter timings will be followed from 12th November, 2018 onward. The timings will be 7:50 am to 1:50 pm. All students will come in their winter uniform from 12th Nov, 2018. Kindly check the DOWNLOAD>EXAMINATION TIME TABLE module for Half yearly exams/ periodic test-2 (2018-19) time table. The learnometer reports for the students of grade 1 to 5 can be downloaded from the link below. Kindly follow the steps as mentioned. Minutes of Parent Teacher Association General Body Meet Held on 15 August 2018 at MGD Girls' School, Jaipur. 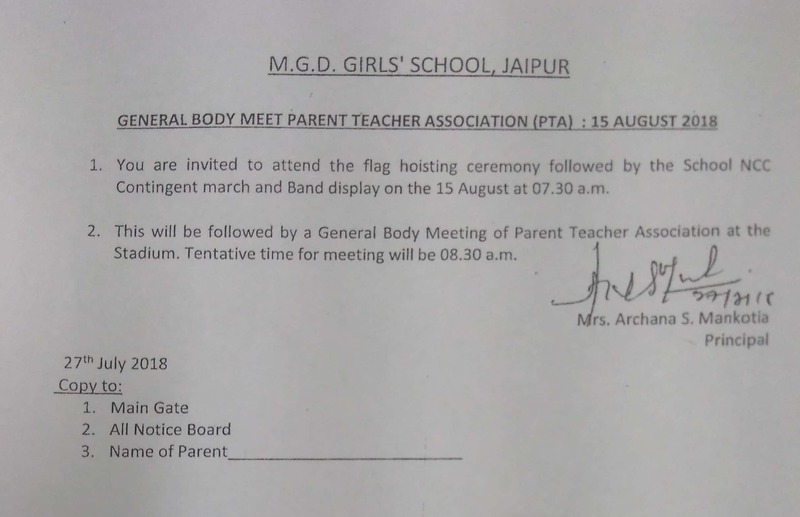 Dear Parent, please check the link for minutes of Parent Teacher Association General Body meet Held on 15 August 2018 at MGD Girls' School, Jaipur. 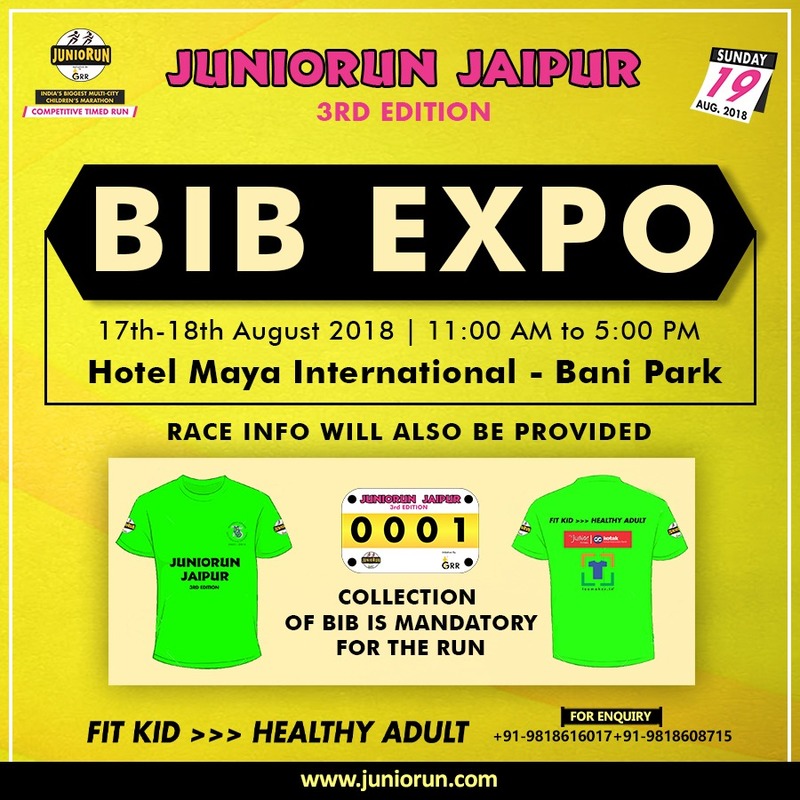 Please click the download icon for details of collection of BIB for marathon organized by Juniorun Jaipur. Route Map for marathon on 19th August 2018 organized by Juniorun Jaipur. 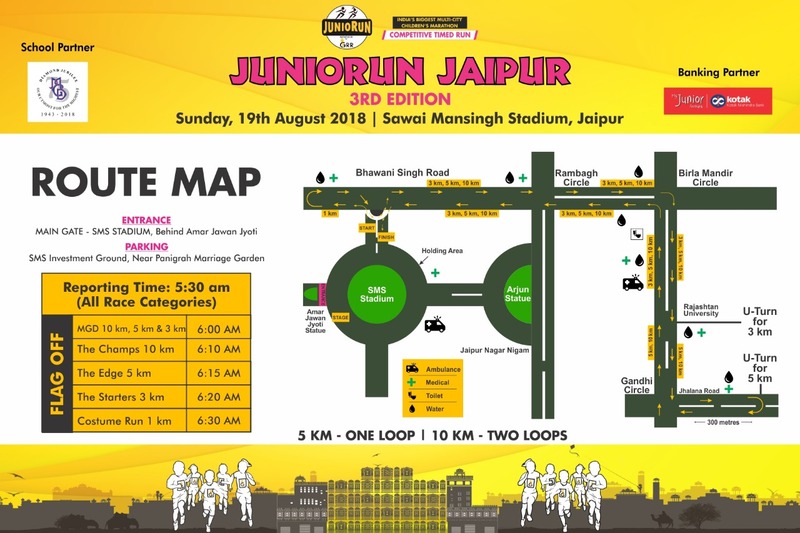 Please click on download icon to see the 'Route Map' for MGD Marathon 2018 organized by Juniorun Jaipur. You are invited to attend the flag hoisting ceremony followed by the School NCC Contingent march and Band display on the 15 August at 7:30 a.m. This will be followed by a General Body Meeting of Parent Teacher Association at the Stadium. Tentative time for meeting will be 8:30 a.m.
Time Table for Periodic Test-1(2018) for classes III to X has been uploaded in 'DOWNLOADS' module. The periodic test 1 for classes I to X will begin from 25th, July to 31st, July. The assessment 1 for class XI and XII will begin from 20th, July to 31st, July. Click on the download icon for viewing the file. 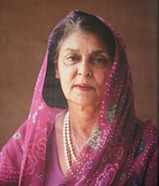 You will always be remembered for your accomplishments and dynamic leadership. Thank you for for all the years of dedicated efforts in taking the School to great heights. Wish you good health and happiness in future. As directed by the collector, School timings for students have been revised to 7:20am to 12:00 noon with effect from 1st May' 2018 untill further orders.